Collaborative law provides an opportunity for you both to work through the things you need to sort out following your separation to enable your family to move on with life in a positive way. It is a way to find solutions together to relieve the distress and disruption which can affect everyone in a family, including any children, during and after separation. You will each have your own collaboratively trained lawyer who will work with you both in a series of joint meetings to resolve the matters that concern you both and these can include making arrangements about your children and working out your financial arrangements to prioritise the needs of everyone in the family. We will work together to explore the possible options open to you both; to test out how these would work in practice and then to find a way to structure the agreement which you both decide would ultimately work best for your family. Your collaborative lawyer will be able to give you individual advice as and when you require this between joint meetings so that you have the freedom to discuss matters fully at each stage before committing to a final agreement. The collaborative process works for most people because it offers reassurance that we are committed to working out practical and lasting solutions for your family together without engaging in contested Court proceedings and we all sign an agreement to this effect at the start of the process. Where children are involved, their needs are prioritised at all times. 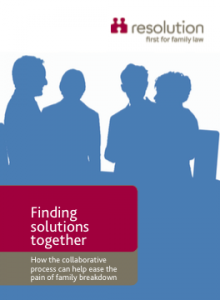 If you would like to find out more about the collaborative process and whether it would be the best way for you both to work out how to deal with matters relating to your separation, please contact Sarah-Jane Riddell who is a collaboratively trained lawyer at sarah@brightonandhovelaw.co.uk or by calling 01273 205 805 for further information and a free initial consultation. Sarah is trained by Resolution as a collaborative lawyer and mediator and she is a member of Brightpod, a local group of collaborative practitioners and of Lawyers Who Mediate.